Outwell Sleepin Double 3.0 cm Self Inflating Mat With two Single and a Double mat in the range, the Sleepin is a great choice for touring campers seeking a sound night's sleep. 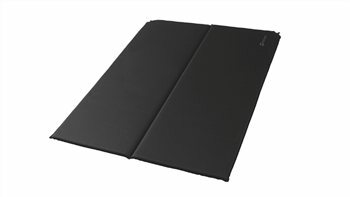 Offering reliable and durable performance in a universal black colour, these mats cover the core insulation and comfort needs and pack down small for transport and storage at home. The easy-to-use plastic valve offers fast, effective inflation and deflation. There is much more to our self-inflating mats than meets the eye. Simple in principle, the secret of reliable, long-term performance lies in the rigorous selection of materials to ensure both comfort and durability over time. The rolled mats' carefully selected foam cores expand when the ingenious valves are released, drawing in air to be sealed inside. The result is outstanding insulation from the ground and excellent sleep comfort for campers.